QF-Test is primarily a tool for the creation and execution of automated tests. However, it is rarely possible - or economical - to automate 100% of the required tests for a project. In most projects some manual tests need to be performed as well. One of the biggest challenges in testing a project is consolidating the different results and reports of automated and manual testing to get an overview about the execution status of all tests. To facilitate reporting the results of manual test execution along with those of automated testing, QF-Test now offers the capability of tracking manual tests from within itself. The steps to be performed during a manual test have to be defined in an Excel file which is read by a test-suite called ManualTestRunner.qft. This test-suite is provided along with a sample specification file in the directory demo/manualtester below the QF-Test installation directory. The test designer has to specify each step in that Excel file including the expected result. After stepping through the manual tests QF-Test provides the usual results - a run-log, HTML and XML reports. Additionally, a newly created Excel file with the results of the respective test-run is created. For a detailed description please see section 27.2. 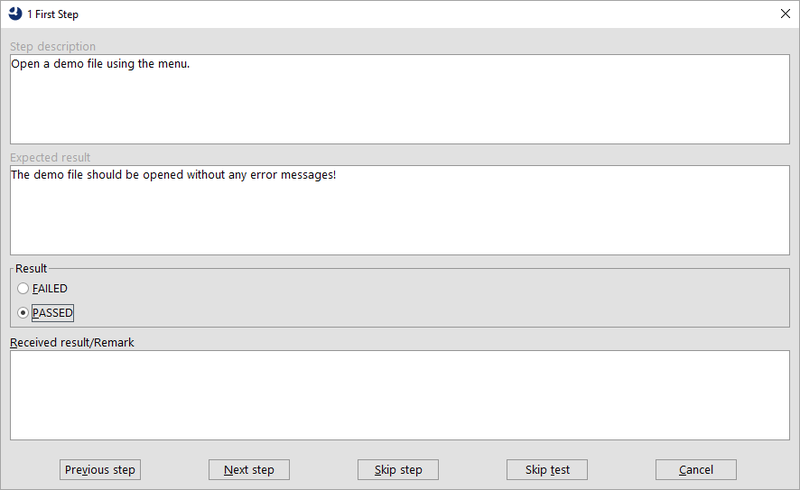 The title of the dialog shows the name of the test-case. The detailed step description and the expected result are shown in the first two text-boxes. After performing the test the tester has to specify whether the test succeeded or not. In case the test failed the tester also has to enter the received result which is intended to show the differences between the actual and the expected result. This dialog can also be used for your own purposes, see section 50.1. Please perform the following steps on your system to launch a manual test from QF-Test. Copy the definition Excel file from qftest-4.5.2/demo/manualtester/SampleTestDescription.xlsx to your project location and rename it to a suitable name. We recommend to use the same path on all test-systems. Perhaps you can make use of a shared network drive. Also copy the execution test-suite from qftest-4.5.2/demo/manualtester/ManualTestRunner.qft to your project location. You may want to rename it as well. Open the Excel file and define the test-steps. After saving the changes to the Excel file, open the execution test-suite and adapt the global variable testFile variable to target your specific Excel file. Turn off the QF-Test debugger. It would only interfere with the steps of the manual tester. Start the test-suite via selecting the test-suite node and pressing "Start test-run". QF-Test will now read the data from the Excel file and open a dialog containing the first test-step. Enter the result of the test-step and proceed with executing each test-step. At the end of the test execution QF-Test will write a new Excel file containing the test description and the according results. You can also store the run-log of that execution or create an HTML report. Please read the comments in the test-suite and Excel file carefully, because you can adapt this concept according to your needs. It is even possible to start only specific tests. TestCase A unique identifier for each test-case. If the step belongs to the same test-case as the previous step, just leave this column empty. Type of Test Optional definition of the kind or function of the test or step, e.g. a functional test or a usability test, startup, etc. Comment An individual comment for the test-case. This comment will be shown in the run-log of QF-Test. Short Description A short description about the content of the test. Step Description The detailed description of the manual step. Expected Result The description of the expected result of that test-step. Received Result The result the tester received during test-execution. If a test-step fails, the tester must specify a received result. State The state of the test, i.e. PASSED, FAILED, CANCELED or SKIPPED. The ManualTestRunner.qft test-suite contains some global variables at suite-level which provide fine-grained control over test-run. These are explained in the following table. All variables not listed here are used internally by the test-suite and should not be changed. testFile The path to the test-step definition Excel file. testSheet The worksheet of the Excel file containing the test-steps. resultSheet The name of the worksheet for the results. tests A list of tests to be intended to execute. If this variable is empty, all tests will be executed. If you want to execute only test 5 and 6, you can specify 5,6 or 5-6. It is even possible to specify things like: 1,3-5,7 to execute the tests 1, 3, 4, 5 and 7.
defaultState The default selection of the state. You can set it either to PASSED or FAILED. All other states will be converted to FAILED. testCaseColumn The heading of the column containing the test-case number. commentColumn The heading of the column containing the comment. shortDescColumn The heading of the column containing the short step description. stepDescColumn The heading of the column containing the full step description. expResultColumn The heading of the column containing the expected result. recResultColumn The heading of the column containing the received result. stateColumn The heading of the column containing the state of the test. PASSED The test-step was successful. CANCELED The test-step was canceled. SKIPPED The test-step was skipped.